Benchmark was one of the firms that spearheaded the current DAC revival, a few years back. In fact, it's not so much the firm itself that did it, more its reputation which went before it via the internet in true 'viral' fashion. Internet fads can, of course, crop up around all sorts of unlikely products and services, but the reality of the DAC1 is pretty much the epitome of solid engineering. You may or may not like the front panel appearance, but the stuff inside is almost a check-list of audiophile must-haves: all-linear power supply; top-quality digital receiver; sample rate converter and DAC chips. Now we said in the Arcam rDAC review that getting a basic DAC together doesn't necessarily involve much more than putting the right parts in place, but it's the detail that really matters, which will show up in the listening and lab tests. This is also true in the headphone output stage, which isn't your usual op-amp-and-a couple- of-resistors afterthought. 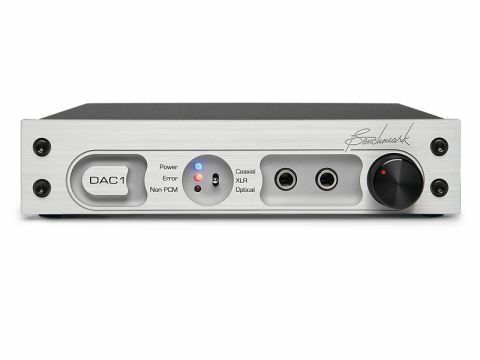 Benchmark has provided the DAC1 with a couple of very high-performance dedicated integrated circuits for headphone driving, which boast specifications so far in advance of what's actually required for the job that it's unlikely they will be a serious limiting factor. No complaints there! As befits a device which is clearly conceived with the audio professional in mind, there are pro touches, such as balanced output alongside the phono sockets, AES/EBU digital input, and the choice of calibrated output level (adjustable via rear panel trimpots) or variable, via the front panel control. Build quality is excellent and operation is simplicity itself. Benchmark makes special mention of its 'UltraLock' jitter reduction system: we don't have details of how it works, but it seems effective. If there was one aspect of this DAC's performance that caused the odd mild reservation, it's in the scale of the sound. It's not so much the business of imaging that seems to be at issue here, more the overall effect that's a combination of imaging with dynamics and tonal fullness. It is possible, though, that this is, in reality, a symptom of the DAC1's extreme cleanliness and purity of character. It does sometimes happen that very clean audio sounds a little underwhelming in the short term, simply because we expect (from past experience) a touch of roughness at high levels and when it's not there we assume the worst. It certainly has plenty of detail and an admirably neutral tonal balance. Imaging is precise and stable and there is a believable sense of 'air' around performers. In addition, there is a real sense of life and energy in the music, something which our listeners appreciated in all of the musical extracts presented. Equally in Led Zeppelin and Rachmaninov, the DAC1 captures the rhythmic quality and 'drive' of the music, allowing the emotion full rein and ensuring that it is never a boring listen. Incidentally, we can't let this review pass without also complimenting the headphone output, which is very fine indeed and for regular users of 'cans' makes an already attractive proposition look very tempting indeed.